“Barabbas came to us by sea…,” these are the words that started and ended this wonderful book of Isabel Allende. These are the very same words that captivated me to read this novel. I encountered this book as a required reading for one of my subjects in college. This book is a rare find and gave me a hard time looking for it. Luckily, I found it in a second hand book dealer as the last remaining copy. The search for this book had paid off well since it introduced me to rich writing styles of Latin American authors. The novel is about the epic story of the Trueba family as told by Esteban Trueba and Alba. Esteban is a cruel landlord, while Alba is his granddaughter. The story started off with the diary entries of Clara, narrating her childhood stories and revealing her mystical powers. The story was then taken off by Esteban Trueba, which narrates his life in his hacienda and his married life with Clara. The last part of the book is narrated by Alba. Played in the background is the history of Chile progressing from the age dominated by landlords; to the rise of the democratic society, the climax of which is the election of the first socialist president; and the demise to a brutal military rule. What I like about this novel is I got to connect with the people affected by their History. It is unlike retelling the history of Chile from a boring history book. I got to see their happiness, their anguish, their desperation for a better tomorrow. I got to connect the novel with the story of my country, the Philippines. 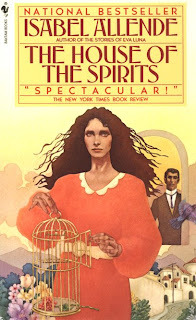 The House of Spirits is a good novel to read and a good example of an excellent writing from a Latin American author. Isabel Allende spun history, emotions, and magic into a one engaging book. Read “Another Use for the Pink Fence” in my personal blog, Before the Eastern Sunset. The blog post is about my idea on the use of MMDA’s pink fences to help decrease traffic violations.